Simba has a home! 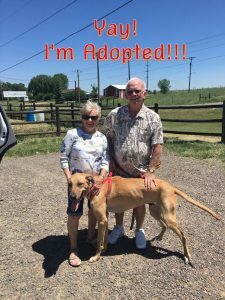 - Rocky Mountain Great Dane Rescue, Inc.
Simba has a home with Pete & Pat in Monument, CO. This awesome family has had three Danes over the years, each “one at a time”. Pat and Pete simply love the companionship that Great Danes have brought to their homes and hearts. They live on 5 fenced in acres, so their new boy Simba will be able to gallivant the property and have a blast doing so. Spooky is the family’s 18 year old cat who is very used to having dogs around…so Simba will have a fur friend to hang around with. The love that this family will be able to give sounds endless! Way to go Simba!